Share your photos on Instagram with the hashtags #fairytaledresspattern and #oliverands. The ultimate fully-lined, special-occasion dress with crinoline. 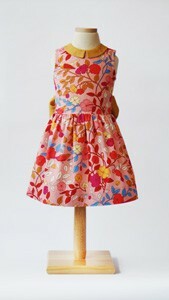 View A features a Peter Pan collar, tulip cap sleeves, tubular waistband, and front bow detail. 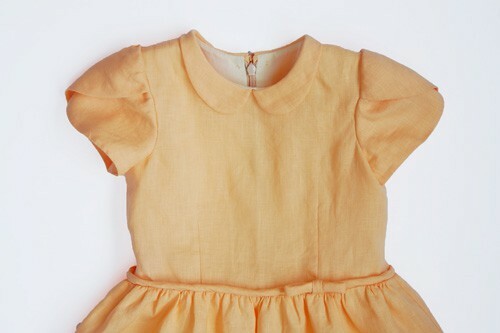 View B is sleeveless and has a modified Peter Pan collar and a bow at the back. Note that this is a fitted dress. Be sure to measure your child carefully when choosing a size. We recommend making a bodice muslin to ensure a good fit. After successfully sewing this pattern, you will have developed the following skills: collar, darts, lining, set-in sleeves, and zippers. Dress: Light- to medium-weight woven fabrics like quilting cotton, chambray, voile, lawn, shirting, poplin, broadcloth, silk, and linen. Lining: Lightweight fabrics like voile and lawn. Tulle: For extra volume in the skirt. Coordinating thread, one invisible zipper (12" for sizes 6M–24M, 14" for sizes 2T–4, 16" for sizes 5–6, 18" for 7–8, 20" for 10–12), lightweight fusible interfacing, one hook and eye. Chest 21" 21 1/2" 22" 22 1/2" 23" 24"
Waist 21" 21 1/2" 22" 21 1/2" 22" 22 1/2"
Length* 17 1/2" 18 3/4" 20" 21 1/4" 22 1/4" 23 1/4"
Chest 25" 26" 27 1/2" 28 1/2" 30" 31"
Waist 23" 24" 25" 25 1/2" 26" 27"
Length* 25 1/2" 27 1/2" 29 1/4" 31" 33" 35 1/4"
I made up this pattern in 4 different sizes ranging from 24months to 5 years. It is a fabulous design. I used View B but added the sleeves from View A. I used ivory silk dupion for the dress and blush chiffon underlined with silk organza for the sash. The pattern drafting is excellent and very little tweaking was required for a perfect fit for all 4 children. Will post pictures on I stageam when the wedding has taken place. I used this pattern to make Christmas dresses for my daughter and niece— both two. I omitted the waist darts because my daughter has a bit of a baby belly and because I wouldn’t have my niece on hand to fit. I modified the pattern slightly— used the view B sash and collar (I think) but the view A sleeves. It worked amazingly, even for a relatively novice clothes sewist! I have only opened it and read through the instructions and traced the size I think I will need. I have chosen a cotton and a lining. Plan to stitch and fit the muslin after the Christmas holidays. I will be excited to get started after that. I own 5 or 6 of the Oliver + S patterns to dress the one grandchild! Each has been a joy to plan and sew. I think this one will be 'Fairy Tale' perfect too. With all these 5-star reviews, you can hardly be doubting whether this would be a good purchase. The instructions are clear, detailed, and thorough. I have used this pattern more than any other in my collection- and just bought the 5-12 because my daughter is outgrowing the size 4. I can see making many more of this in the future- but now i use the techniques from The Building Block Dress book to add pockets :) Thanks for making such a perfect pattern! Digital fairy tale dress gave me back my motivation to sew!! As always with Oliver + S, an absolute delight to make. 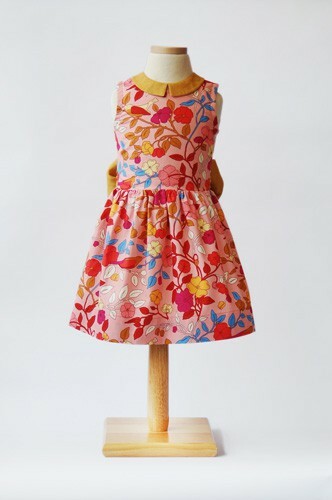 I purchased the pattern in both sizes to make the dress for my daughters 5th birthday, she would normally wear a size 5 but is very tall and slim so I went with the size 4 and still had to run the darts in at the back. MAKE THE MUSLIN!! Sometimes it might feel easier to skip this step but it's so important to get the fit right. Don't be intimidated by any components of this pattern or the hand sewing, the instructions will help you get a perfect result. I completed the project in a few evenings (some very late ones!) but it was absolutely worth it, just beautiful. oliver + s - the only patterns you'll ever need! Simple & easy to follow - they're my go to pattern for my favourite little girls! This pattern had very clear instructions and they were very detailed. I would highly recommend it to anyone wanting to make a similar garment. I had a great result. I just finished sewing this dress and the result is very satisfying. This dress is beautiful inside out. Lots of hand sewing but so worth it. 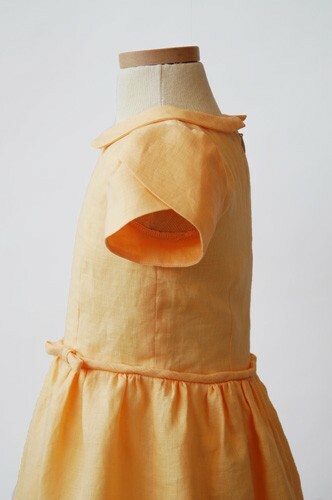 This is not a difficult dress to sew, the instructions are very clear. I love this pattern and have done several versions of it at this point... From corduroy to sequins and silk; sleeveless, tulip sleeves and cap sleeves; Collar and no collar. It's easy to change out sleeves, modify the length of the bodice or change the gathers to pleats. I made this dress for my granddaughter, out of navy silk Dupioni, loved the style! I made a few changes, eliminated the collar and added mini piping to the neck and armholes. I also eliminated the neck and armhole binding by sewing the lining to the bodice at both the neck and armholes and pulling the backs through the shoulders and then sewing the lining and bodice side seams as one continuous seam. Thanks for the muslin recommendation, I had to make a size larger than she measured. I've been sewing for just under a year, and found this pattern to be great.I just finished a holiday dress for my daughter, and while there were a lot of steps, it went very smoothly. The instructions were very clear and well-written. The pattern itself is great -- I really liked it! I made a muslin first and that is the key. I was able to adjust the fit in the shoulders and practice the sleeves before cutting any fabric. It turned out so great! I'm so proud of myself! Thanks for a great dress pattern. I just finished a Fairy Tale Dress for my daughter's preschool graduation. I fell in love with the pattern for its unique tulip sleeves and its classic (but not stuffy) silhouette. It was a lengthy project, especially if you take the time to make all the little details, but it was so worth it! As always, this pattern has great finishing details and a very straightforward construction. I felt like I learned a lot, and the finished product was an instant hit with my daughter. I loved the instructions for installing the invisible zipper, which resulted in a perfectly laid out zipper with no frustration. 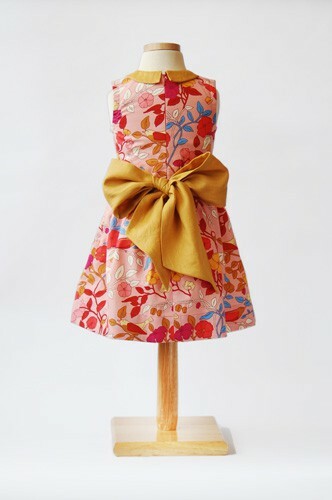 It will definitely be a favorite dress around my house! I made this dress for my niece's flower girl dress for my recent wedding. The pattern came together in a few hours and looked fantastic. I chose it for it's vintage classic look and it was exactly what I was looking for. I've made this pattern 3 times without modifications and used it as a base for several others, all in the last two years! It's involved and takes some time to put together, but the end product is well worth it and the instructions make it possible for anyone who has made a couple other projects to complete. Wonderful instructions, and a great fit. I love that there are so many adaptation options. Don't be frightened! So the pattern description sounds pretty daunting, doesn't it?! But really, there's nothing overly difficult about this pattern. The instructions are of the quality that you only get from Oliver + S. If you've never sewn an invisible zipper before then this is your best starting point. All the rest is broken down into little steps and you will be delighted with yourself when it all comes together. There are two views given with the pattern, but the options for mixing and matching sleeves, collars and belt/waist trim make it like 8 patterns in one. I find that as I'm sewing a Fairy tale dress I'm already imagining the next one. I give this one 5 handsome prince kisses! I am very grateful that Liesl made this fine pattern as simple as possible. it has a lot of finishing details but it doesn't overwhelm this beginner-intermediate seamstress that much. The only improvement i have is for Liesl to provide more pointers on tweaking the pattern for fit. the dress armhole is way too big and unflattering on my daughter. 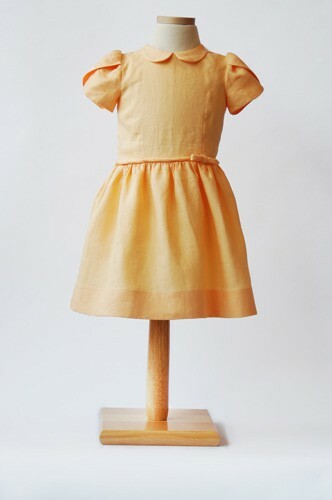 the pattern is more suitable for kids with broader shoulders. I ended up taking her dress that fits, superimposed it on the dress and tweaked it based on that. it's probably not the correct way of tweaking but it works. The project was definitely challenging, especially the sleeves, but the end result is fantastic. I was really pleased. My little girl looked like a princess in her fancy Christmas dress! The fairy tale dress is by far the most complicated dress pattern I've ever sewn, having done just two simple sundresses before, and only having sewn one zipper in my life.... but my daughter chose it so off I went and while it did take me some time and a few tries in places, the instructions were so clear and thorough that it all seemed straightforward and easy and the end result was just great! I sewed a dress for my 4.5 yr old daughter and it turned out perfect! I made a size 5 for her and it looks like she'll be able to wear it now and for another year or two. Then her younger sister can wear it! The only thing I would change next time I make it is to make the big sash that is only in the back of view B and have it come to the front of the bodice as well to add a little something to the front. Love it. Can't wait to make a special dress out of this pattern. Love the sleeves. In the first printing of the printed version of this pattern, sizes 5-12 only, the lines and labels for piece 6, Collar (View A), were reversed. Use the size 5 line for size 12 (and vice versa), size 6 for size 10 (and vice versa), and size 7 for size 8 (and vice versa). This error has been corrected in the digital version of the pattern now available. Discussion on the digital fairy tale dress sewing pattern from the Oliver + S Discussion Forums. Find and share more photos on Instagram using the hashtags #fairytaledresspattern and #oliverands.